The certification ECU (smart key ECU assembly) generates a request signal and sends it to the door electrical key oscillator built into the front door outside handle assembly (for front passenger side) at 0.25-second intervals. To detect a key near the front passenger door, the front door outside handle assembly (for front passenger side) creates a detection area with a radius of approximately 1.0 m (3.28 ft.) from the front passenger door at 0.25-second intervals. 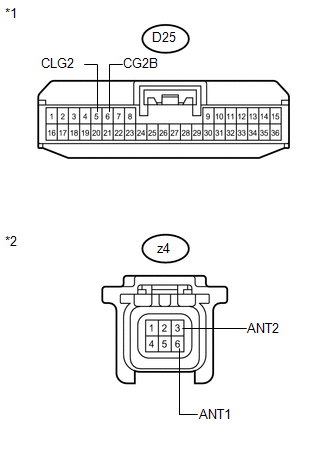 DTC B27A2 is detected by the certification ECU (smart key ECU assembly) if an open circuit is detected between the certification ECU (smart key ECU assembly) and front door outside handle assembly (for front passenger side) terminals (between CLG2 and ANT1, or CG2B and ANT2). 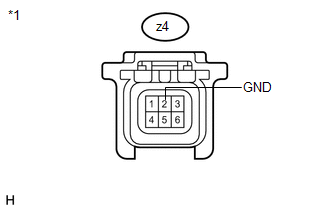 Open circuit detected between the certification ECU (smart key ECU assembly) and front door outside handle assembly (for front passenger side) terminals (between CLG2 and ANT1, or CG2B and ANT2). (b) Check that the connectors are properly connected to the certification ECU (smart key ECU assembly) and the front door outside handle assembly (for front passenger side). (b) Measure the resistance and check for pulses according to the value(s) in the table below. (a) Replace the front door outside handle assembly (for front passenger side) (See page ). 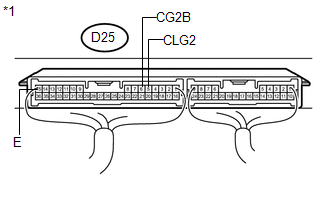 DTC B27A2 is not output.